Every customer who does creative sewing will want this book to learn the "What, When, Where, Which, Why and How" of using Sulky stabilizers. A 16-page pullout pattern sheet is included. Projects, ideas, and tips from over 50 well-known industry professionals are also included. Sulky Secrets to Successful Stabilizing Book - Why use a stabilizer when you sew? And what, when, where, which and how to do it? All the right answers are just waiting for you in this special book! Written by Joyce Drexler, a recognized leader in the field of "Machine Arts and Crafts", you will also learn from over 50 well-known industry professionals. Learn practical applications and guidelines - not rules - for usage. Use this book as a source of inspiration, reference and information. You get over 25 exciting projects on wearables and crafts, plus lots of ideas. Comes with full colored photos, full size applique patterns and step-by-step instructions. Softcover, 136 pages. An ldea and Technique Book of ways to use Sulky Stabilizers by Joyce Drexler. 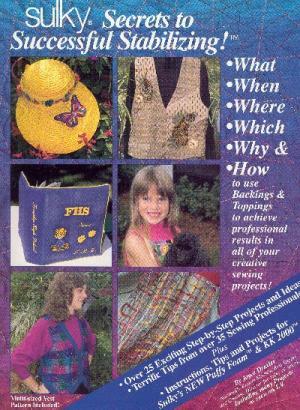 136 jampacked, full-color pages of exciting step-by-step projects, ideas and tips from over 50 well-known industry professionals, plus an original, multi-sized vest pattern.